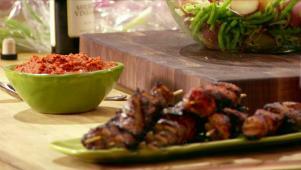 Anne Burrell prepares for game time with unexpected but deliciously tailgate-friendly Pork Kebabs With Romesco. 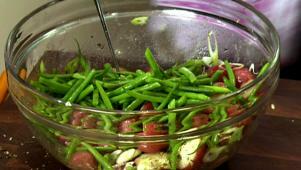 She also shares her secret for maximizing flavor in her String Bean and Potato Salad. Why you should dress potatoes while they're still warm? Watch and find out. 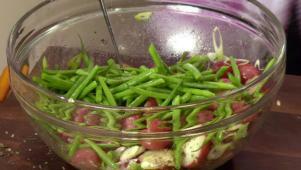 Make your cookout complete with Anne's secret for a flavorful potato salad. 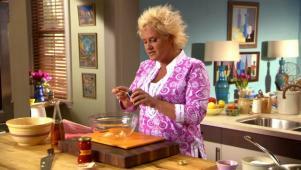 Anne Burrell prepares tailgate-friendly Pork Kebabs with Romesco. 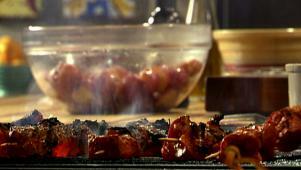 Grilled pork with romesco adds Spanish flair to the all-American tailgate.